You can easily pass ASQ Manager of Quality/Organizational Excellence (CMQ/OE) Certification with the help of our online practice exam. We are here to help you every step of the way to pass your Manager of Quality/Organizational Excellence exam. Our team of experienced and certified professionals with more than 12 years of experience in the field of Quality Control has designed practice exam to prepare for ASQ CMQ/OE certification. They have carefully maintained exam structure, syllabus, time limit and scoring system same as the actual ASQ Manager of Quality/Organizational Excellence exam. Our ASQ CMQ/OE question bank contains most frequently asked and real-time case study based questions prepared by collecting inputs from recently certified candidates. To get familiar with our online ASQ Manager of Quality/Organizational Excellence certification practice exam environment, we invite you to try our sample practice exam to build the trust between us. All the questions covered in sample practice exam are basic Manager of Quality/Organizational Excellence Certification exam questions. 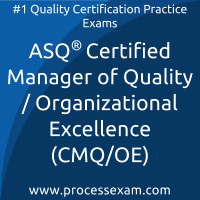 To test your knowledge and understanding with the real-time case study based questions, we strongly recommend you to practice with our Premium ASQ Manager of Quality/Organizational Excellence (CMQ/OE) practice exam. 740+ Practical and Real-time Case Study Based Practice Exam Questions similar to actual ASQ CMQ/OE certification exam and their correct answers for assessment. 2 Months Unlimited Access to online Manager of Quality/Organizational Excellence (CMQ/OE) certification practice exam. We have a dedicated team of ASQ certified experts who are having more than 12 years of experience in the field of Quality Control. Our structured and autonomous review system collects feedback from recently certified candidates, based on those inputs our domain experts frequently update ASQ Manager of Quality/Organizational Excellence test questions for practice. Our online practice exam is a simulation of the actual ASQ Manager of Quality/Organizational Excellence exam that makes you familiar with actual exam environment and exam pattern. We offer unlimited practice attempts with our online practice test. Every attempt randomly populates questions from our premium ASQ CMQ/OE question bank that contains 740+ most probable case study based questions prepared by our domain experts. Practice questions will be served in random order with shuffled multiple choice answers to make your Manager of Quality/Organizational Excellence exam experience more challenging. You can review the results of past practice attempts from result history and assess your performance. Such facilities are the significant advancement over questions in CMQ/OE PDF and far better than fraud dumps sites. According to our survey with ASQ CMQ/OE Certified candidates, you can easily score 80% in the actual ASQ Manager of Quality/Organizational Excellence exam if you can score 100% in our online practice exam. The real test is the time limit, others can be overcome eventually. I used to time my performances earlier but with CMQ/OE mock tests, that was not necessary as these have the actual time limit as the Manager of Quality/Organizational Excellence certificate exam. I got to conquer my weakness in time management and this helped me in my professional and personal life as well. The Leadership guidelines and techniques and the key deliverables of the Leadership Challenges topics were like monsters for me. However, practicing on the CMQ/OE questions helped me clear the exam with good scores and am very happy. ASQ CMQ/OE mock tests opened up my avenues by helping me clear the Manager of Quality/Organizational Excellence certification exam. I was able to score well in the exam at the very first attempt because I received an extreme amount of practice and that is quite needed i think. I happily covered the syllabus and accompanying exam with the help of mock tests. There are several features available with the premium CMQ/OE practice tests. I particularly liked the result history which helped me strategize how to clear the actual Manager of Quality/Organizational Excellence certificate exam. The mock tests have carefully maintained exam structure. The topics are similar, so is the scoring system and also the time. This helped me clear CMQ/OE certification exam smoothly without any hassles. In fact, i have even recommended Manager of Quality/Organizational Excellence premium questions to the next batch.